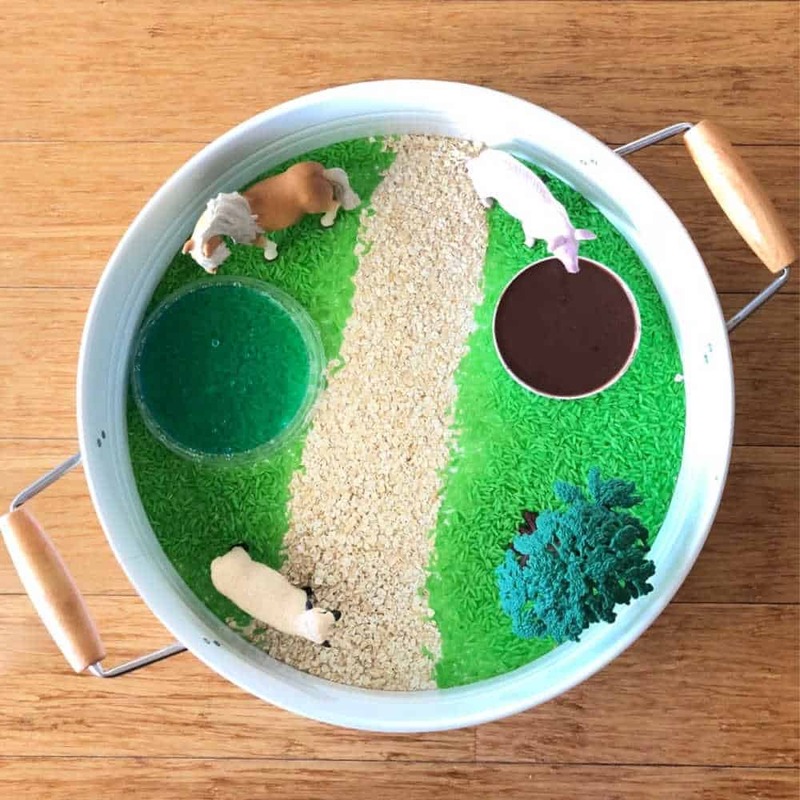 Today I’m going to show you how to set up a sensory farm yard small world. 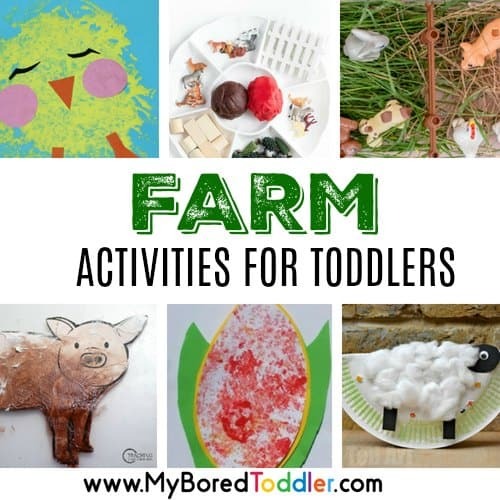 Farm activities have always been a huge hit at our place. We are an animal loving household so any environment with a concentration of fauna is always going to be guaranteed to be a hit – even during witching hour! Today was no exemption. With dinner needing to be prepared and a little Miss 23m hugging my hip, meal prep was just not happening. That is when I noticed a tiny chicken figurine on my drying rack along with the utensils used earlier today. Yes, a chicken on the drying rack… I would not have thought that would happen pre-parenting! That humble, feathered fowl reminded me of a little something special I have had in mind these last few days. Within a few minutes ( and a quiche and date fed to Miss 23m to distract her) our Farm Yard Small World had been assembled. Metal Play Tray (or any tray or container you have). You can get these HERE. As soon as my kids see me carrying our round metal play tray they know that something good is happening. I will hear ‘Mum is making an activity!” and then feet slapping on the floor as 4 of them run to where I am. Our metal tray is used for all sorts of things however small worlds are something that look beautiful and so inviting! Don’t have a play tray? Dont stress! Baking trays and plastic storage tubs work beautifully too and you will be surprised at how easy it is to set up your own small world activity within minutes! 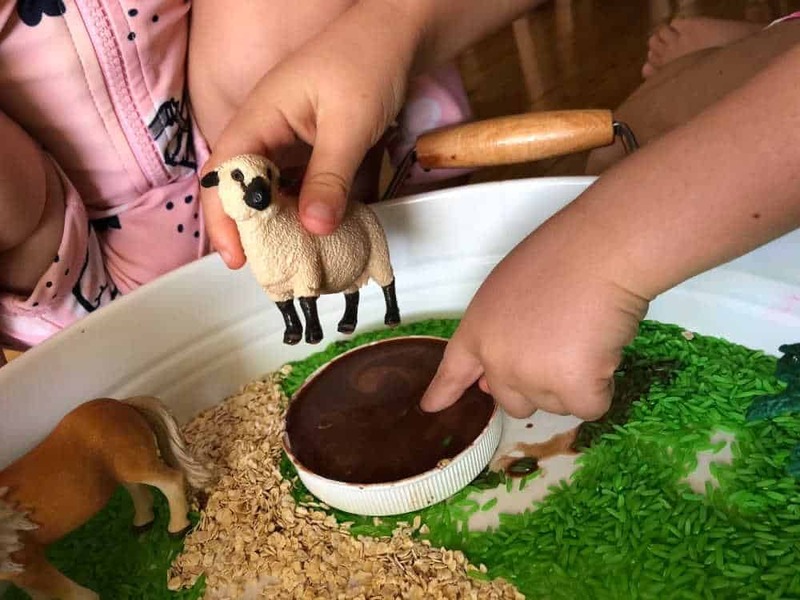 What I had envisioned for today was a quaint little farmyard scene with an additional sensory play element – sensory play is super engaging for my kids so it should keep them busy while I watch from the kitchen bench while getting dinner sorted. Miss 23m is still exploring the world by tasting and mouthing so making our Farm Yard Small World taste safe was an absolute MUST! A quick scan of the pantry, a hop skip and jump into the playroom and we got busy building our farm yard small world! 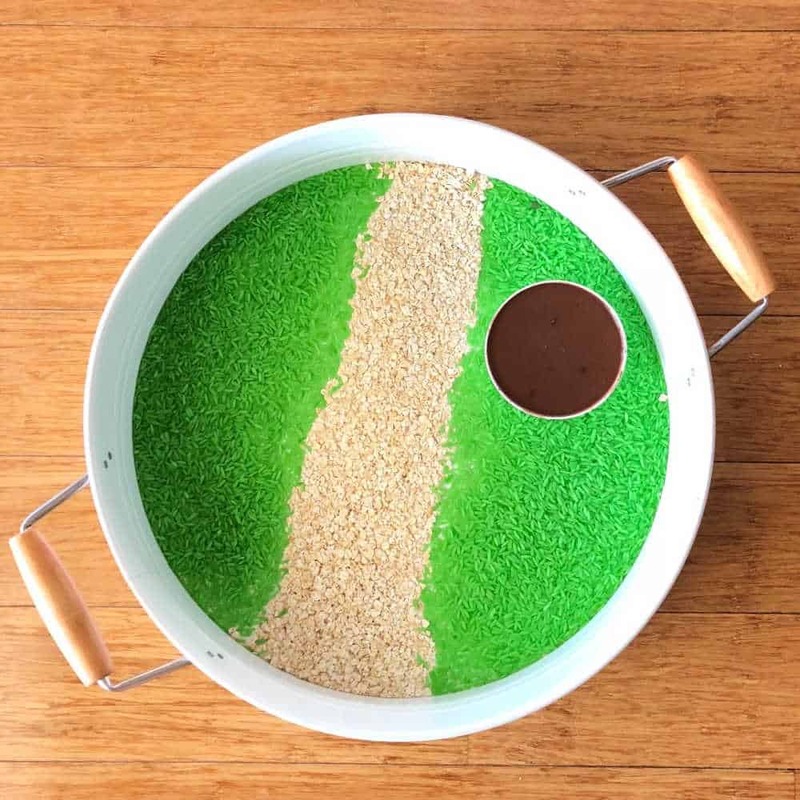 To start with, we created a little road using good old quick oats. I kept this path to the centre of the tray purposely but will run through the reasons why later down the page. We use oats quite a bit in our sensory play. They are soft, smooth and a little dusty to feel. Not to mention, completely taste safe! 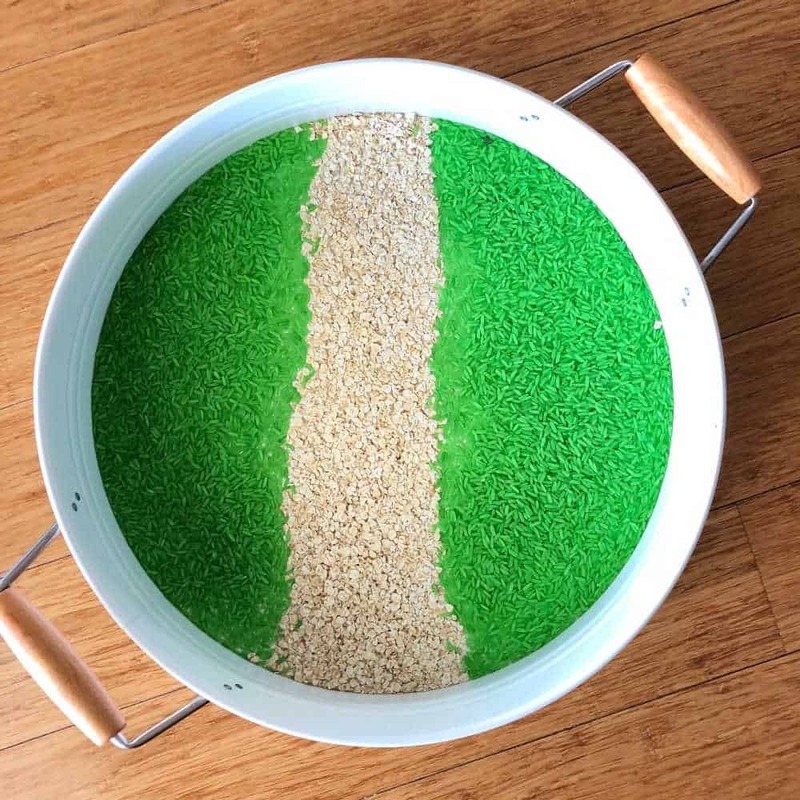 On either side of our oat path, I poured some green coloured rice to replicate grass. I love the bright vibrancy of this rice! 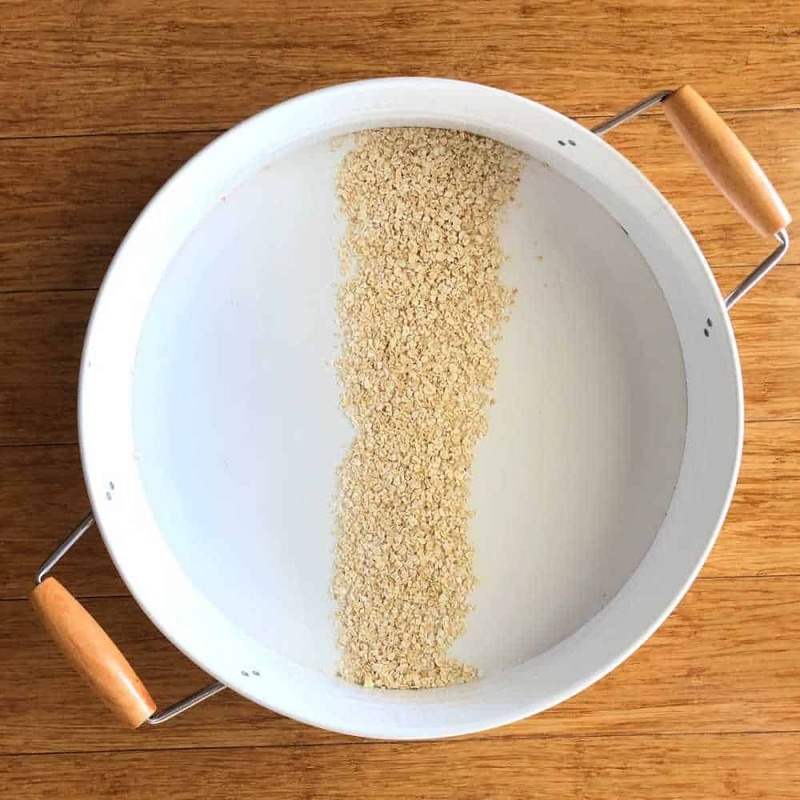 We have used this rice for so many activities. Once we finish playing, I just funnel it back into its jar and pop it into the cupboard for another day. 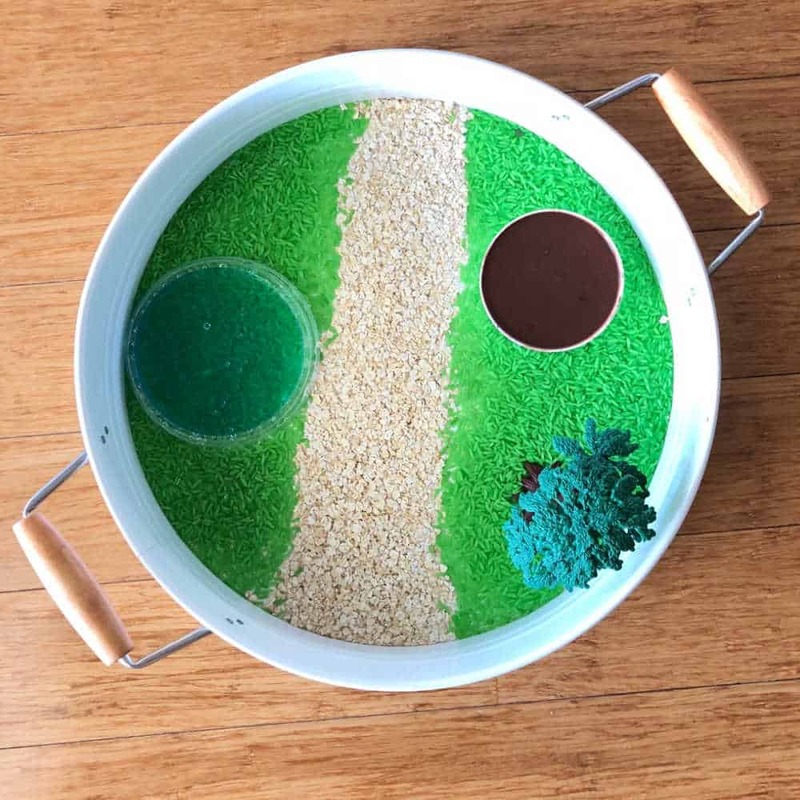 That being said, this coloured rice is going to be sacrificed for some fine motor fun and really messy play! Now… the fun part! Well, not that brightly coloured rice and lovely smooth oats isn’t fun it’s just that this next part really amps up the excitement! Our third sensory element added to our Farm Yard Small World was Oobleck. Its science and sensory in one. Its a solid under the pressure of squeezing fingers and a liquid once the pressure is released. Its oozy, goozy and completely taste safe made from ingredients most likely found in your pantry already! I mixed up our Oobleck in a little cup and added half a teaspoon of cocoa powder to make some messy taste safe mud and poured it into a jar lid that we kept for moments just like this! 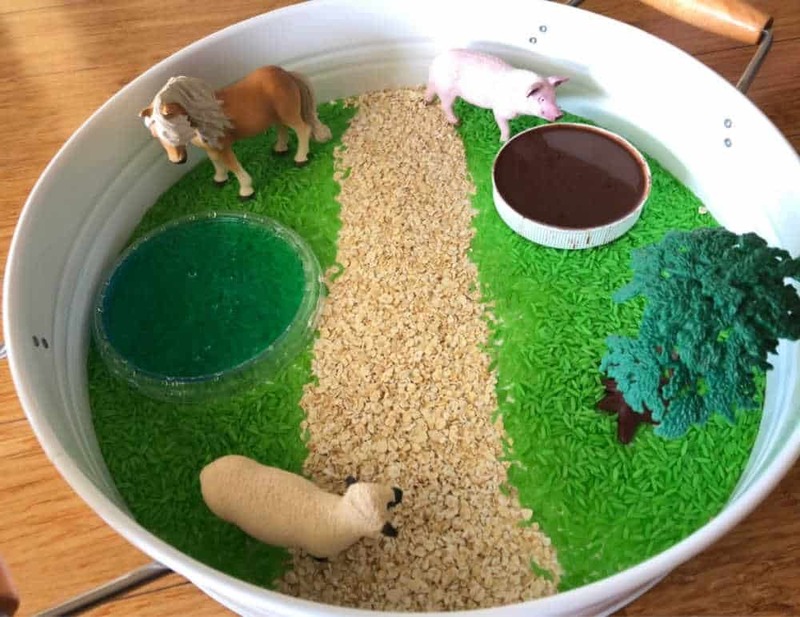 Lastly, an empty lid was transformed into a delightful little pond with some coloured water and a little plastic tree for some shade for the animals. The girls were asked to select three farm friends to enjoy our little setting. Within seconds a sheep, pig and horse had been nominated and two twitching little girls were keen to jump in hands first! Sensory play engages your child’s senses and allows them to learn more about their surroundings. Information can be taken from their environment via their five senses; touch, smell, taste, hearing and sight. This data fed to a developing brain, encourages brain connections and fuels a thirst for more input aka learning! 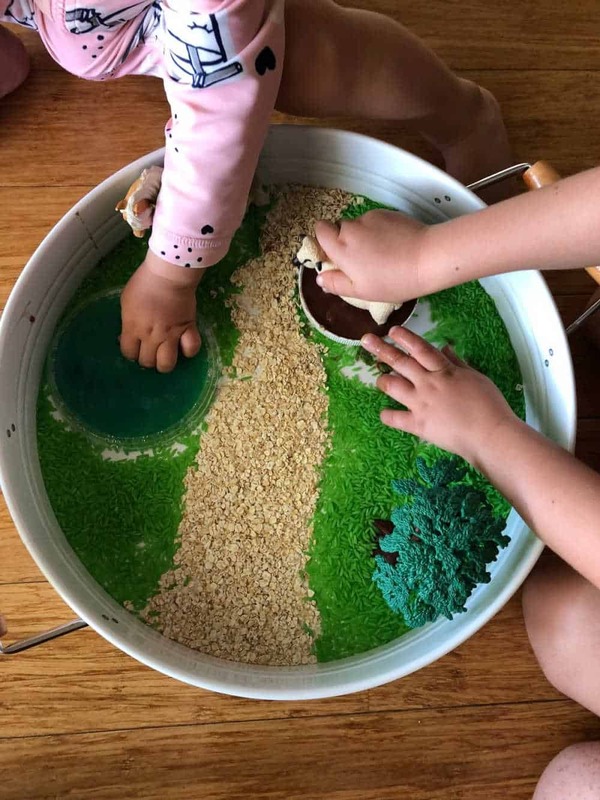 Sensory play is not only fun but aids in cognitive development, problem solving skills, motor skills, language skills – the list goes on and on! Do you have a sensory avoider? All that stimulation can be too much input for some growing brains (or grown ones for that matter) and that is okay. Why not tone it down to just one sensory medium? 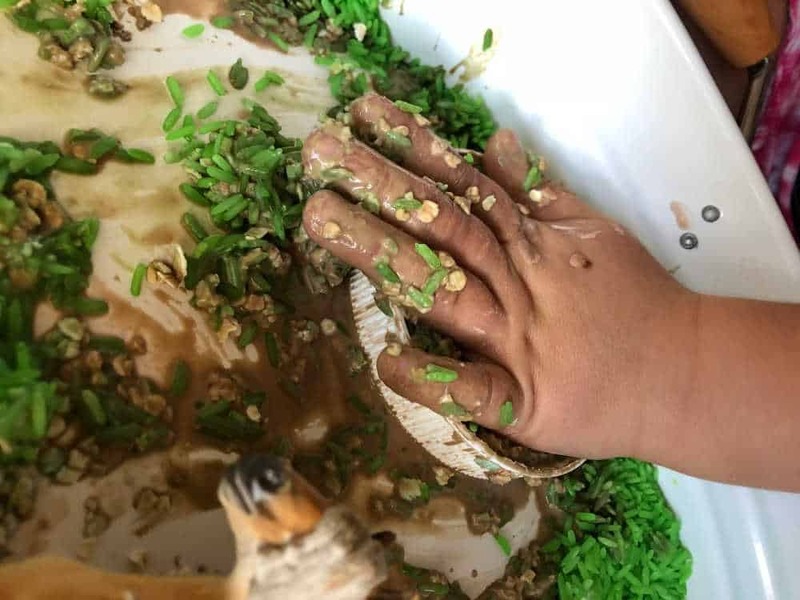 Does your child not like getting their hands dirty? That is okay too. Why not place some sensory medium into a ziplock bag with some figurines? 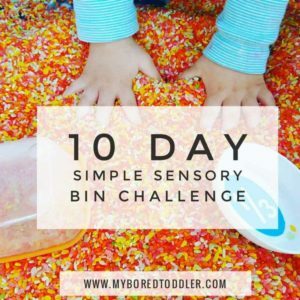 What I love about sensory play is that you can tailor your child’s experience to suit their strengths, needs and interests. How to Play With Your Farm Yard Small World? This is a question I get asked often. Parents and caregivers please don’t over think it and enjoy watching your child explore this beautiful invitation to play that you have created for them- follow their lead! Help your child build their own story with open ended question – who, what, when and where. These will help build context to their play, their vocabulary and comprehension all while making wonderful memories of time you have spent together. Remember how I mentioned how I made the path travel down the centre of our small world? Well this was to help Miss 23m understand some directional instruction. Left and right, to the green side, to the white side, behind, in front and above and below are all words intended to mention and practise with our farm friends. Does your little one need some direction? Why not refer to a recent book you have read that ties in well with your farm theme? Sing Old Mac Donald and put on some funny voices, refer to a trip you made to your local petting farm together or a recent craft that you made together. 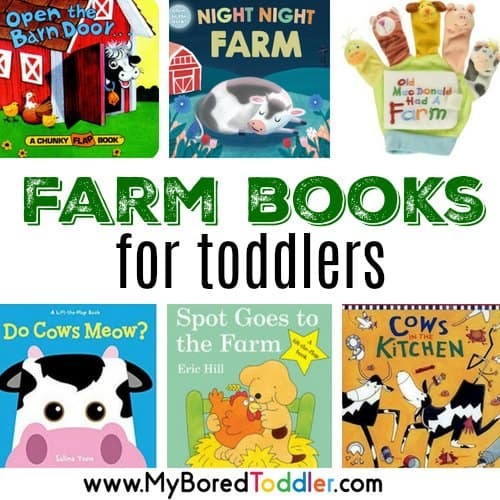 You can find some great toddler Farm books here. Most importantly, have fun! Get messy and have some laughs! 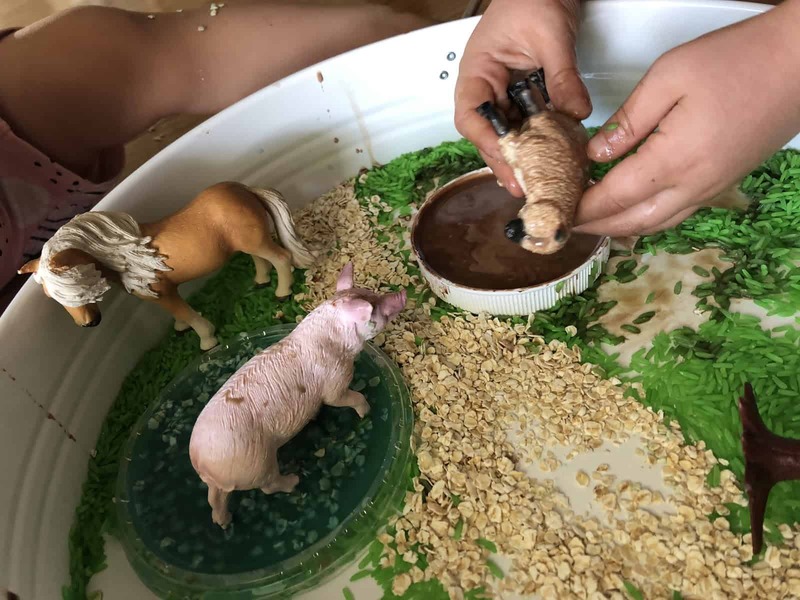 We would love to see how your toddler played with their farm sensory bin – share a picture on Instagram (follow @myboredtoddler and use #myboredtoddler ) or share a picture in our Facebook group. « How to survive if your baby has infant colic.